5 Reasons to Experience Dogtona! If you want to include your dog in some of your family&apos;s Spring Break fun, be sure to add Dogtona! to your calendar. This annual event hosted by the Hendricks County Humane Society will provide families with an opportunity to have fun and bond with their dogs or even meet a new dog to adopt from 10 a.m.-3 p.m. April 1. The event will be held at the Hendricks Power Exposition Hall at the Hendricks County 4-H Fairgrounds & Conference Complex. As a fellow dog owner and lover, I put together five activities to look forward to at Dogtona! Does your dog have a special talent? 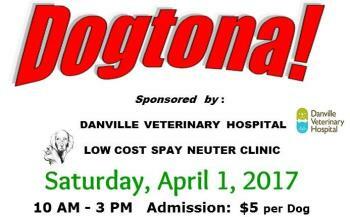 Enter your dog into the Dogtona! talent show. Dogs can also compete in the Any-Dog dog show for a chance to take home the title of this year&apos;s Best Kisser, Best Dressed, Best Tail or Best Rescue Story. Games will include the Leave It Competition, Steppenwolf, A-Frame, Sidewinder and more. The Hendricks County Sheriff&apos;s Department will put on a K9 demonstration to show how K9 officers work in law enforcement. Get a free family photo taken with your dog at the event. Several vendors will be available with dog-related products, and food the whole family will enjoy will be available for purchase. Rescue groups will bring dogs and other animals to the event to meet with families and individuals who would like to provide a forever home for a lovable pet. When: 10 a.m.-3 p.m. April 1. Where: Hendricks Power Exposition Hall at the Hendricks County 4-H Fairgrounds & Conference Complex, 1900 E. Main St., Danville.